Take your snowboards with you into the backcountry. This lightweight aluminum snowboard rack is designed to fit all ski-doo snowmobiles. 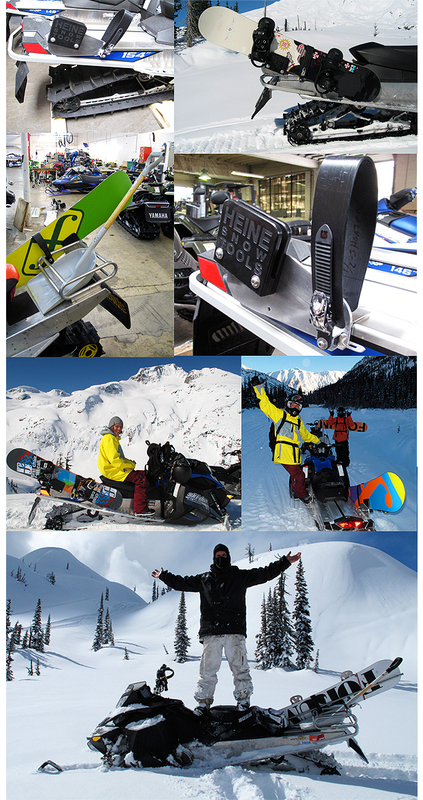 The Heine Snow Tools snowboard rack has been tested to with stand the bumpy trails & cold temperatures down to -50 degrees. 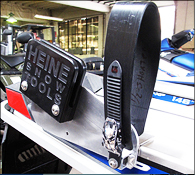 The entire Forum snowboard team uses Heine Snow Tools racks on their snowmobiles. New for 2011. Lightweight and compact aluminum snowboard rack. 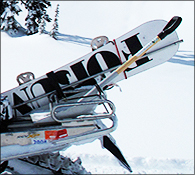 Lightweight aluminum snowboard rack tubing is designed to tie down anything with bungie cords. Holds 1 snowboard, gas can or large shovel. Rack is specially designed to hold those large grey shovels so you can build those backcountry kickers. Rack can be custom ordered to hold 2 snowboards one board on each side of rack.